Harvesting of cranberries begins at the end of September and lasts until the frost. The berries pass the winter excellently on the field and there are some red berries even in the spring. 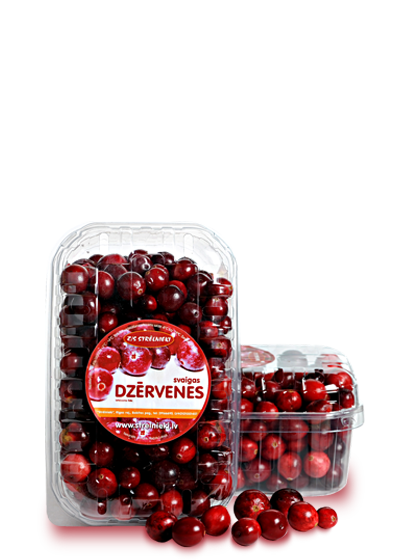 Similarly as the common marsh cranberries, the large cranberries can be used for food in different ways – fresh, dried, in preserves, juices, canned, etc. They can excellently supplement the traditional taste bouquets due to their bitterly sour taste and brightly pink colour what will make the food more colourful. These berries can be prepared in cater sugar or mixed with honey in order to make various beverages or food. The berries should be frozen in order to make them juicy like marsh cranberries. The frost breaks the cell walls down making berries juicy. Nowadays, the freezing of berries is the best way of preserving berries.